This state­ment is being issued on the 18th of March 2017 and super­sedes all pre­vi­ous state­ments on the sub­ject. Sayyiduna Bilal (RA) was the caller of Prayer for Prophet Muham­mad (Peace be upon Him) but today the chil­dren of his land are call­ing for your help. His foot­steps were heard in par­adise, today your foot­steps can reach par­adise if you answer the call of his land. 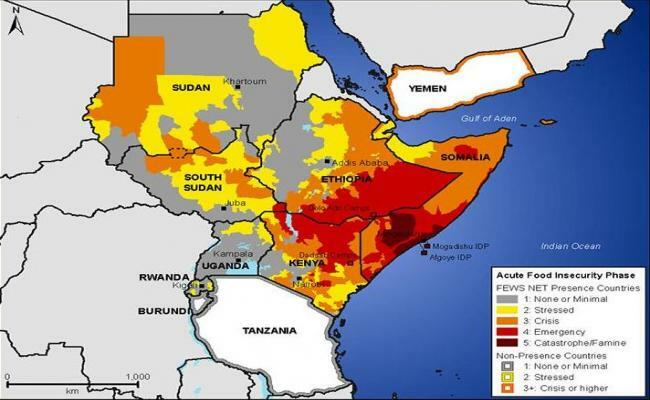 East Africa is cur­rent­ly suf­fer­ing from a drought, war, and lack of food. More than 880,000 chil­dren are severe­ly mal­nour­ished and des­per­ate­ly need life-sav­ing sup­plies. With­out this help, one in five of these chil­dren could die.The bur­den of the food cri­sis has proven to be affect­ing the chil­dren espe­cial­ly hard. When a famine is declared, it is esti­mat­ed that four chil­dren out of every 10,000 die every day because of a lack of food. Famine has been declared in parts of South Sudan, where more than 270,000 chil­dren are already suf­fer­ing from severe mal­nu­tri­tion, and Soma­lia is also on the brink of famine. We must act now to save as many lives as pos­si­ble. Chil­dren in Ethiopia, Kenya and Ugan­da are also fac­ing severe food short­ages, with more than 3 mil­lion chil­dren strug­gling to sur­vive. With­out enough food and clean water, children’s lives are in extreme dan­ger – we need your help. Why is Somalia worst hit? After 20 years of civ­il war Soma­lia is one of the poor­est and most dan­ger­ous coun­tries in the world. One in five chil­dren die before their 5th birth­day. What can you do spiritually? As Mus­lims, our first reac­tion in any sit­u­a­tion should be to reflect upon our actions and to turn to Allah Ta’ala to beseech Him for his assis­tance and help. We urge all Mus­lims in Britain to make sin­cere Dua for the peo­ple in East Africa. We also ask you to encour­age your friends, fam­i­ly, and com­mu­ni­ty to turn to Allah Ta’ala. Give Sadaqah in addi­tion to your Duas to invite the Mer­cy of Allah Ta’ala. What can you do financially? Al-Imdaad Foun­da­tion: Al-Imdaad were also fea­tured in Soma­lia Media. Their cam­paign is called “The Lands of Bilaal (RA)”. What can you do politically? I am writ­ing to you because I appre­ci­ate your efforts in rais­ing aware­ness about the plight of East Africans, and also your pledge of £200,000 which will help to improve so many lives. I am gen­uine­ly touched by the warmth and gen­eros­i­ty of the Scot­tish peo­ple. How­ev­er, as you are well aware, there is a lot more that needs to be done to ensure that no more lives are lost. I urge you to press the British Gov­ern­ment to do more for East Africa. This des­per­ate sit­u­a­tion calls not for rhetoric but tan­gi­ble help. I have trust in the warmth and gen­eros­i­ty of the British peo­ple who have always come for­ward to assist those in need around the world. I am proud of this coun­try and its glo­ri­ous tra­di­tion of help­ing oth­ers. I am writ­ing to you as a human­i­tar­i­an who is deeply con­cerned by the famine in East Africa and its impact on the chil­dren, who are dying in their droves due to hunger and mal­nu­tri­tion. You may be aware of the pledge made by the Scot­tish Gov­ern­ment to donate £200,000. I believe that they should be com­mend­ed for their efforts, and that the British Gov­ern­ment should emu­late this exam­ple and pro­vide more aid for those in des­per­ate need. I urge you to press the British Gov­ern­ment to do more for East Africa. Not just words but actu­al and tan­gi­ble help to those who are the worst affect­ed by this famine. I have trust in the warmth and gen­eros­i­ty of the British peo­ple who always come for­ward and assist those in need around the world. I am proud of this coun­try and proud of its glo­ri­ous tra­di­tion of help­ing oth­ers. I urge you to con­tin­ue to press for this issue in Par­lia­ment. Also, I express my wish for you to con­vey my posi­tion to ALL mem­bers of Par­lia­ment. Fur­ther­more, I wish that you con­vey my posi­tion to the to our Hon­ourable Prime Min­is­ter There­sa May.